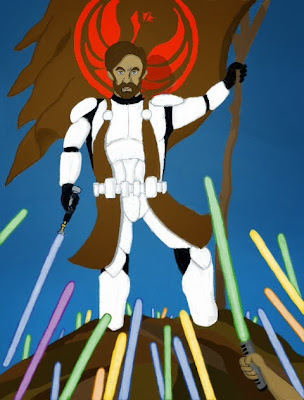 Mormon Wookiee: #123: Captain Morobi-Wan. 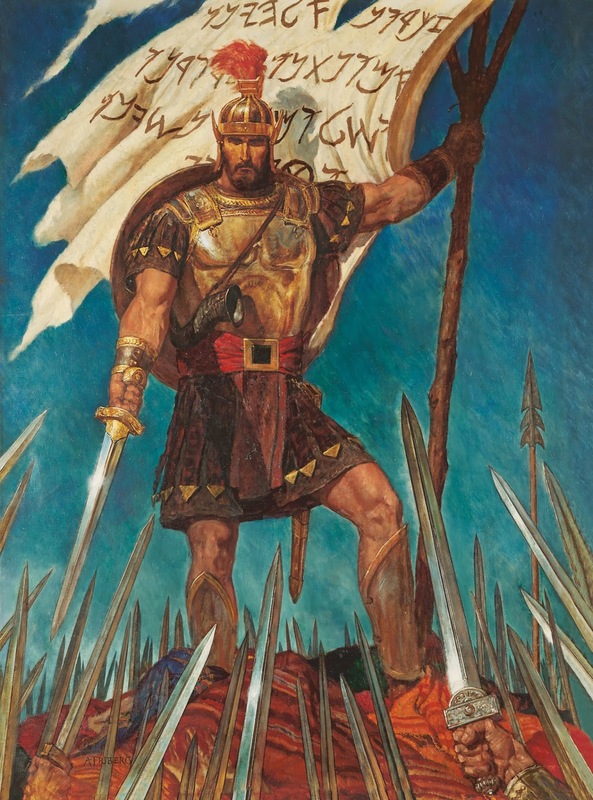 As a kid, I loved the Book of Mormon paintings by Arnold Friberg. Friberg's depictions of Nephi, Ammon, and the Stripling Warriors all looked like superheroes with their bulging biceps and massive weapons. But of all of Friberg's paintings, my absolute favorite was Captain Moroni. To a young boy, there is just something magical about him. He was righteous, he was brave, and he "didn't take no crap from nobody" (not an actual Book of Mormon quote). In his writings, Mormon said this of Captain Moroni: "Yea, verily, verily I say unto you, if all men had been, and were, and ever would be, like unto Moroni, behold, the very powers of hell would have been shaken forever; yea, the devil would never have power over the hearts of the children of men" (Alma 48:17). Think of it--if we were all more like Moroni, Satan would have NO power over us! That's a powerful statement. Since my blog is called Mormon Wookiee, I thought it would be fun to take my own Star Warsy spin on some of Friberg's paintings (after all, imitation is the sincerest form of flattery). With that thought in mind, I now present to you my very first attempt at Arnold Friberg's Star Wars: Captain Morobi-Wan. Enjoy! To be honest, I like your version equally. Although I’m not a diehard star wars fan to be honest, I still get the idea behind it.